There’s something elegant yet comforting about stroganoff. This recipe has the bonus of being supremely fast and easy to make AND it’s good for you (unlike the butter, beef and sour cream laden traditional recipes, which are a cholesterol-fest in a pot). 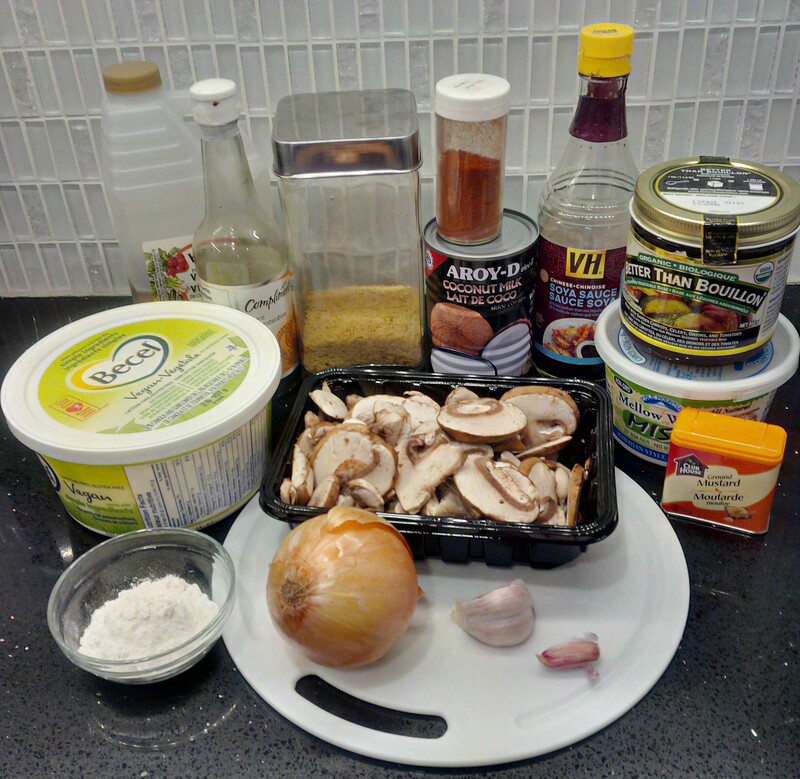 I went very simple with this dish – mushrooms only. But, you could easily brown some Gardein “beef” tips or vegan meatballs and add them to the dish for a heartier meal. Melt the margarine in a pot or large pan and add the onion and the garlic. Stir on medium heat until the onion is soft and translucent. Add the mushrooms and sauté until the mushrooms have released their liquid. Sprinkle the flour over the sautéed vegetables and stir to heat the flour through. You want to get the raw flavour out of the flour. Your veggies and flour will likely bind up and make an ugly wad – don’t worry! Add all the other ingredients and stir well. The veggie-flour wad will break up and you’ll have a gently golden sauce. Stir occasionally and allow to simmer (not boil) for 5-10 minutes. Serve over pasta or potatoes. This sound delish. A couple of questions; what is the purpose of the nutritional yeast and does the coconut milk taste really coconutty? thanks! Hi, Thea – good questions! The nutritional yeast helps add that savoury, umami flavour. On its own, nutritional yeast is flaky (it looks like fish food) and tastes sort of nutty-cheesey like Swiss cheese. Also it’s loaded with B12 and protein and fiber – all good things. And I promise you, there is not a hint of coconut to this dish when it’s all done. It’s almost witchcraft how the coconut milk is just transformed into sour creaminess with the addition of the vinegar, Worcestershire and miso.